Product descriptions are under construction-if you have any questions on a product please contact us directly! Cookies and cream have never looked so good! Dragon Vein Agate beads paired with a brass 22 bullet casing, accentuate the "marble and gold" trend we all dream about. 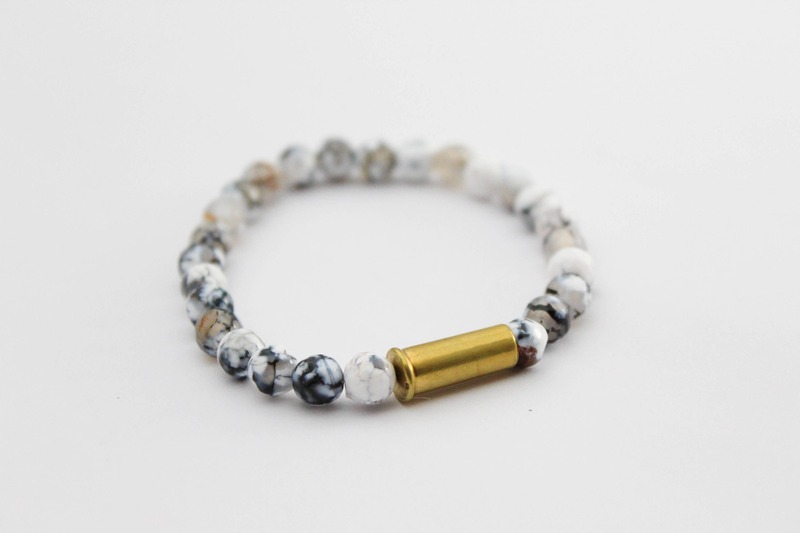 Whether a work day, or range day- this piece adds a little extra to your every day ensemble. Dragons Veins Agate originates from the Byzantine Empire and promotes energy and strength. It is also used to cope with the inevitable. Legend says that Agate improves memory and concentration, increases stamina and encourages honesty. The perfect minimalist gift for any gal pal, significant other, or family member! *Each bullet has been shot by me at designated and supervised outdoor gun ranges. A single bullet goes through a significant amount of stress when in the chamber, therefor no bullet looks alike once spent. These unique markings left on a spent bullet are a story all their own, just like us!